JC Fisher, Marcus Collins, and John Hagen formed The Texas Tenors in 2009. The Texas Tenors identify as a classical crossover trio vocal group, since its members consist of a country singer, a pop singer, and an opera singer. They premiered on the national stage in 2009 with the fourth season of NBC’s America’s Got Talent. The group finished as one of the top four finalists, making them the highest ranked vocal group in the show’s history. Since that whirlwind debut several years ago, the group has accumulated a long list of awards and accolades. They have collaborated with some of the most prestigious symphonies and performing arts centers throughout the world. 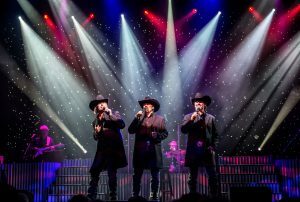 So far, The Texas Tenors have performed well over 1,000 concerts in over 20 countries around the world – including a 24-city tour throughout Great Britain and China. In November 2013, they filmed a PBS special for their second album, You Should Dream, performing songs accompanied by The Phoenix Symphony. This makes them only one of two America’s Got Talent acts to star in their own TV special for PBS. In 2014, The Texas Tenors received nominations for five Rocky Mountain Emmy Awards and won three for the self-produced special. The group was recently named the #10 Classical Artist in the world by Billboard magazine. Currently, they are in post-production for a new PBS special that is set to air in 2017. The Texas Tenors proudly remain self-produced and managed. This group stays committed to providing quality family entertainment for all ages. Regardless of the medium, these three friends never forget their roots. They are ready to give back to the community whenever they can. The Texas Tenors regularly partner with The ChildFund International, Homes for our Troops, and The Mission Project to promote awareness and raise funds. The Texas Tenors are bringing their unique blend of country, classical, Broadway, and pop music to the American Music Theatre for one show: Friday, July 14 at 8 p.m.
You’ll experience a variety of music from Bruno Mars to Puccini. This show is full of breathtaking vocals, humor, and a touch of cowboy charm. It is one you won’t want to miss! Tickets are nearly sold out for this incredible show, so make sure you pick up yours today!